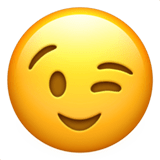 😉 Winking Face Emoji is one of the very first emoji that have become classic. Slightly smiling face with a winking eye and one eyebrow raised is used mostly to impress approval or understanding. You can write it to express agreement with something (as a synonym for OK), or to give a joke to the message ("don't take it seriously"). In a certain context, it can be used as a flirtation, although there are more suitable smileys for it. 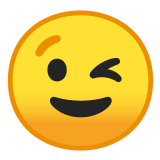 Winking Face Emoji was approved as part of Unicode 6.0 standard in 2010 with a U+1F609 codepoint, and currently is listed in 😀 Smileys & Emotion category. Use symbol 😉 to copy and paste Winking Face Emoji or &#128521; code for HTML. This emoji is mature enough and should work on all devices. You can get similar and related emoji at the bottom of this page.